GB: What are your plans for Druids in ToB past level 14? Will they receive the AD&D abilities as per the rules, or do you have other ideas to compensate for the loss? James: The druids in TOB will be advancing faster than they do in the official 2nd edition rules. However, they still won't match the level progression of a cleric. The druid gains several special abilities as he reaches the higher levels. At 15th level the druid becomes immune to poison. At 18th level the druid gains 10% resistance to all environmental damage (cold, fire, electricity and acid). At 21st and 24th level this resistance is increased by an additional 10%. As well the druid gains special quest spells only available to his class, including a spell that summons in one of the elemental princes. GB: In our past interview with Doug, he had said that clerics were going to have the ability to summon an avatar of their faith. Will there be other summoning spells/abilities added to other classes? Are there any plans to increase the amount of creatures a party can summon at one time? James: There are no plans to change the maximum number of creatures that a party can summon in at one time. However, the cleric is going to be able to summon in some very impressive creatures. He'll be able to summon a 24 HD elemental or an Astral Deva. The Deva is an angelic being with the ability to heal the parties wounds and afflictions, or smite the parties enemies with a powerful sword. GB: How many special abilities will be available to each class, and at what levels will they become available? Will the importance of the new abilities outshine the old ones of the same type (ie. setting traps and summoning creatures)? James: A character will gain one high level class ability per level, once they become available. These abilities become available to a character at a level dependant on his class. The high level class abilities definitely outshine any lower level ability that they might mimic. GB: Two quick unrelated questions about minor game details. Is there a reason why a character can't equip two bows at the same time in his quick-weapon slots? 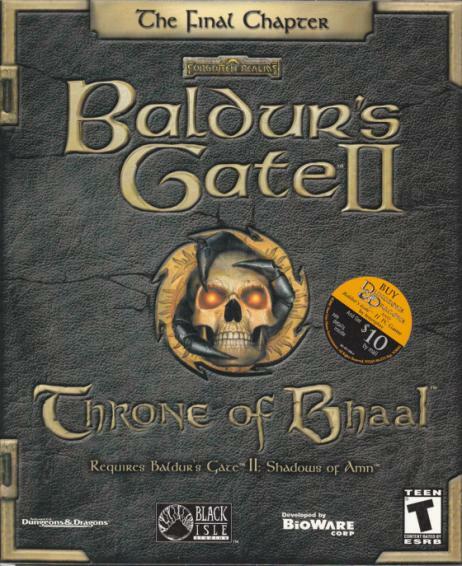 Why was Dimension Door not implemented in BG2 (at least not for PCs, the Cowled Wizards and Irenicus still use it), even though it was available in Baldur's Gate I and Icewind Dale? James: Dimension door wasn't implemented in BG2 as it had the potential to break sub-plots. In order to properly test dimension door (and modify quests that the spell has the potential of breaking) we might have had to delay the game by upwards of two weeks. The spell simply wasn't worth the time we would have to invest into it. There were technical reasons behind why we didn't allow a character to have two bows equipped to his quick slots. James: The Child of Bhaal storyline comes to an end in BG: TOB. By the end of TOB, the player is far too high level to make a sequel even remotely interesting. If there is a BG 3 it will most likely be a brand new storyline starting at 1st level; however, we'll probably try to have a few tie ins, perhaps with characters returning from the previous games.